Why do I have to be the Ewok!?!?!?!?!? jk I really dont care, dude.....they're your figures. You got a pretty good collection there JCT! Keep it up, and who knows........maybe you'll end up in a Star wars magazine or somethin. I like the blue,yellow and green armor most. You should get the commando one. Commander scorch. Have you seen him? Yeah I think thats the one hes talkin about. Thats commander Bacara right? 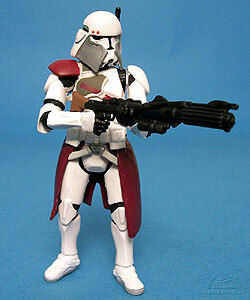 Uh,unfortunately we don't have such nice clones here.....Hmph.Figures. Anyway, here's the updated list of my Clones '*' this means updated. Jeeze! You get clones everyday!! Your collection is growing. Then why can't I find him, took me forever just to find a Commander Cody one. No, Im talking about commander scorch, a republic commando. I know, I can't find Scorch at all, I haven't even seen one. well back on topic I guess. I at least know what he looks like. BTW, you can add the commando to your list, and then buy it then.